This Easter marks ten years since I entered the Catholic Church. Truth be told, the anniversary actually snuck up on me. These last ten years have brought many blessings and constant reminders of how grateful I am to be Catholic. Please indulge me as I share a few with you. The Eucharist is nothing less than Our Lord Himself, body, blood, soul, and divinity. The Catechism of the Catholic Church tells us it is the source and summit of our life. After years of attending Mass with my wife and our (then) three children, coming into the Church at Easter Vigil 2006 meant that I would finally receive Our Lord at Holy Communion. Looking back I do not know how well I comprehended (a better word might be appreciated) this miraculous gift. In the decade since becoming Catholic, I have whispered innumerable prayers of thanksgiving for this treasure. As eucharistia means “thanksgiving”, there is no other way to receive Jesus in the Blessed Sacrament than with complete gratitude. The Mass is our very participation in Christ’s salvific act; it is a representation of Calvary. There is literally nothing more important that we do each week than the time we spend at Holy Mass. Little did I know ten years ago that my love for the liturgy would eventually lead me to blog about it. For me, the sacred tradition of the Church was further discovered a couple years after my confirmation when I attended my first Latin Mass. Assisting at a Mass largely unchanged since the time of Pope St. Gregory the Great in the sixth century has only deepened my prayer life and enhanced my attraction to our Catholic liturgy. Over the last ten years I have found many a convert much like myself who absolutely loves Confession. Saint Jose Maria Escriva called it the Sacrament of Joy. Anyone from a protestant background can attest to the power and perfection of this sacrament. From examining our conscience, to confessing our sins to the priest who stands in persona Christi, to receiving absolution, and then finally receiving our penance, nothing more tangibly speaks to the grace and mercy of Our Lord than Confession. In the basic, everyday, living of my faith nothing more clearly speaks to becoming Catholic than my family. Indeed, I am convinced that my son (child #4) and my youngest daughter (child #5) are only here because of Holy Mother Church. The Catholic Church’s consistent teaching on the family, on marriage, on an openness to life, are the same today as they always have been, and shall be forever more. It was those truths, and the courageous counsel of one holy priest who I am blessed to call my pastor, that helped my wife and I to conform our marriage to Christ. Family today means so many things: a marriage grounded in the faith; children being raised to be saints first and scholars second; driving past three parishes to ensure that my family has a parish life and liturgical setting consistent with tradition and worthy of Our Eucharistic Lord. It means all of this and so much more. I would be remiss not to mention the huge roles that both Pope Benedict XVI and Dr. Scott Hahn played in bringing me to the faith. Before my heart could learn to love the faith my brain needed to understand it better. For this I owe Dr. Hahn immensely. As a baby Catholic I needed a Holy Father who could show me the beauty and timelessness of the Church, one who could enrich my intellect through his wisdom while teaching me humility and docility through his constant example. That was Pope Benedict. 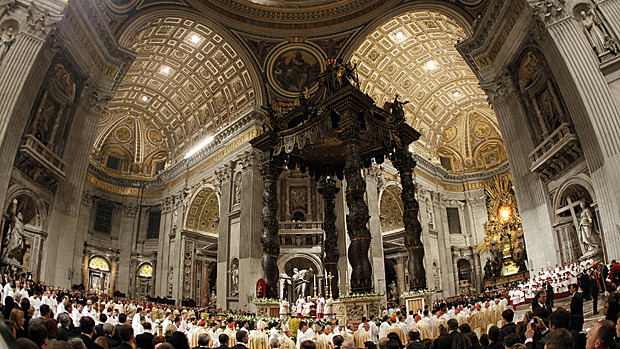 It has indeed been an amazing ten years since entering the Church at Easter Vigil 2006. God willing my next ten years as a Catholic will be as grace-filled and exciting as the last ten have been.